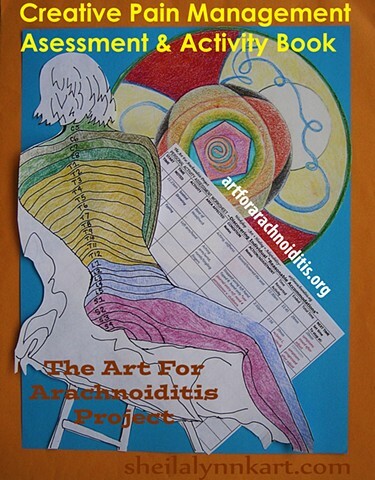 In The Art For Arachnoiditis Project Creative Pain Management Assessment and Activity Book, based on multiple traditional methods and my own creative pain management experience; I am sharing some basic activities that you can use to develop your own Sustainable Independent Process to assess, address, communicate, and manage your pain experience. Enclosed Tools include transparencies, worksheets, DIY Art Journal Instructions, Art Journal Prompts, Introduction to Energy Clearing Activities, and more. Recommended for use with Transparency Markers, Colored Pencils, and any other creative media you choose. This Activity Book is an introduction to a path of Creative Wellness which has helped me to improve my Quality of Life with arachnoiditis. It is NOT intended as a cure or replacement for any existing medical treatment. Be sure to consult your trusted physician prior to making changes to your treatment protocol. and other Chronic Pain Conditions is dedicated to Arachnoiditis Survivors.